How many folks actually refer to Bubble Bobble's second fiddle as Bobblun rather than Bob, I wonder? The image above doesn't give you the whole picture (pun intended) of Tararuj's piece, by the way. Looked at from the side, good ol' Bob--or Bobblun, or whatever you want to call him--and the bubble that encases him pop from the canvas in oh-so-au-currant 3D. 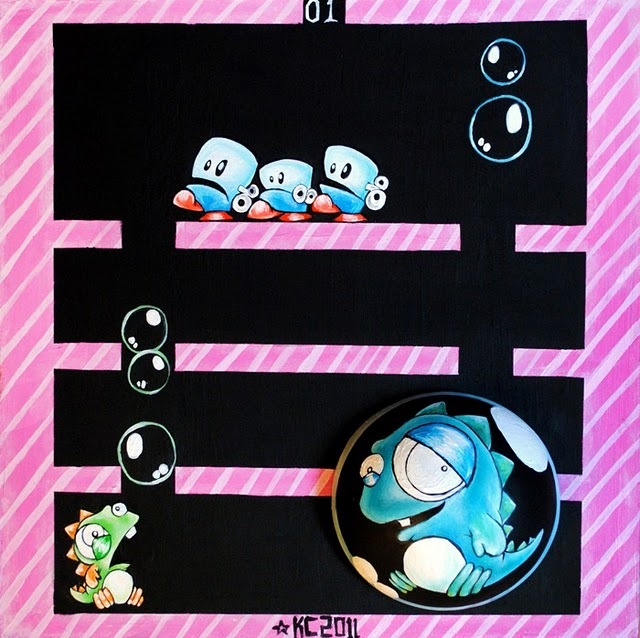 See what I mean, and read why Tararuj chose Bubble Bobble as a subject rather than Circus Charlie, by checking out the artist's blog, kaseytararuj. blogspot.com. That's pretty fantastic. I always opted to play as Bob when I played two player. I liked Blue better...and, no that I think of it...I almost always opt for the second player if there's a choice.